Hey Everyone! Happy Wednesday! I hope you have all had a great week so far. If you've made it through this time in the week you can definitely handle anything that life throws your way for the rest of this week. This week I have been a bit of a emotional wreck. It's just been one of those weeks where I have needed a good cry. Things have been going from bad to worse and I have just felt so down. I have had my cry of the day (my millionth one this week) and now that it's out of the way I'm currently sat in bed with Harry Potter and chocolate to cheer me up. It hasn't been the best week but I'm thinking positive and it definitely cannot get any worse than this. I wanted to write a blog post about my thoughts and feelings at the moment but I'm still working on how I can write it without me sounding like a whiny teenager. It is coming soon so stay tuned for that post. It's definitely the most raw I have ever been. Today however, I thought I would write a post all about my adventures over the past weekend. Enjoy! This past weekend I was in London with one of my closest friends Beki. We went for lunch at pizza hut to catch up on each others' lives and then went to see Phantom of the Opera which was absolutely amazing. It was the first time I'd properly seen Beki in around 3 months so it was good to catch up and have a natter before going to see one of our favorite musicals as it's one of the things we became friends over. We also had a wonder around London which was lovely as the weather was super pretty. There's just something special about London in the summer time and walking around it really inspired me to write why London is my favorite city. It's a place I've been born in and have grown up in but I have always loved it. Here are a few reasons why. Diversity: London is just such an absolutely diverse city. No matter which part of the city you visit you will meet and see people of different ethnicitys and cultures in every direction. In the summer time especially, there are always lots of groups of students on trips from every corner of the world and it's just lovely to see how London can bring everyone together. Within my friendship group there are around 10 different cultures and about 4 different religions and it's just so fascinating learning and being a part of each and everyone of them. London is an extremely open minded city and one I am proud to live in. The Best Shopping: From Oxford Street to Covent Garden to Camden Lock...there is something for everyone in London no matter your tastes or budget. I love all three of these places as they are all so unique and different in their own way. The High Quality Nightlife: There is just no shortage of nightlife in London. From going to restaurants and bars, to clubs to just spending the night at the theatre once again there is something for everyone. 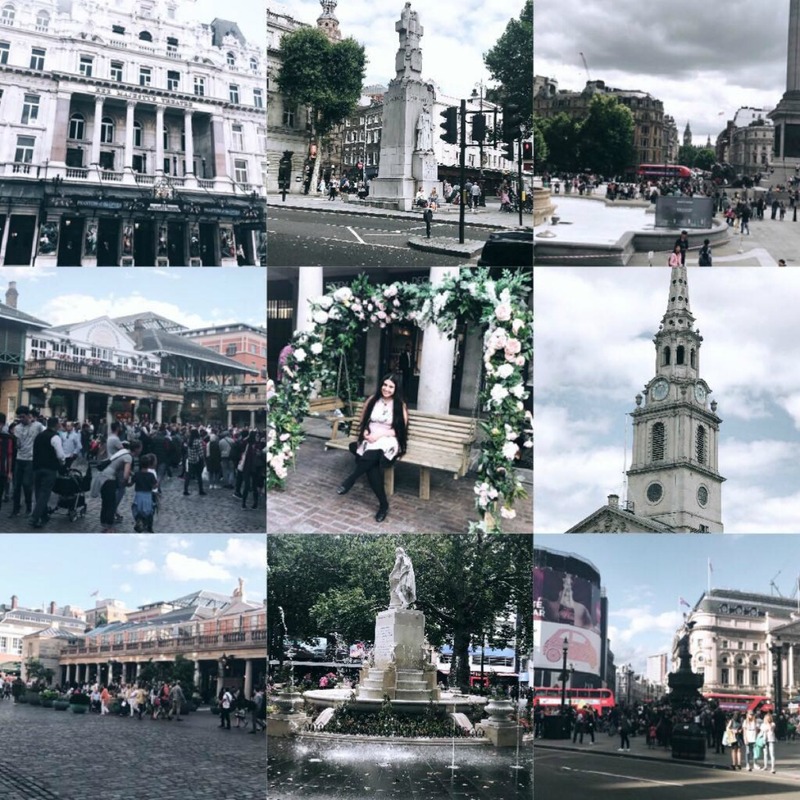 London's West End is my favorite place as I am obsessed with musical theatre so I spend a lot of my time seeing shows like Wicked, Les Miserables and of course my recent visit there included seeing Phantom of the Opera. There's just no shortage of sources to entertain you in London. Modern Whilst Being Historic: I love experiencing modern day London but being a history lover I love exploring the history of London. I love learning about the past and museums such as the British Museum or the V&A Museum and even Buckingham Palace and learning about the royals are just things I absolutely love. A Place To Relax: Yes I know you're probably thinking 'But London is the busiest city in the world?'. This is very true however talking a time out and walking in some of London's parks such as Hyde Park and Richmond Park are super relaxing and are sometimes so peaceful you hardly think you're in London. Hyde Park is one of my favorite places to go to relax. However it's also a place that has something going on. Concerts in the summertime and Winter Wonderland in the winter. It's a place that has always got something going on and I love that. Friendly People: This is something that can be a bit hit and miss. Us Londoners are known for out wide range of emotions however me personally I find London to be a very friendly city. Wherever I go people are polite, kind and always smiling and it's just something I love. It's so nice walking down the city and seeing people smiling at each other. Music: Music is such a big part of London. With the 02 in Greenwich bringing in huge talents like Celine Dion, Bruno Mars, and other amazing artists and then smaller bars and clubs in and around London that host a wide variety of undiscovered talent from all genres of music and all walks of life. As a music lover this is just ideal for me. It's Such A Photogenic City: London is one of the most beautiful places in the world. No matter what corner you turn you can always take a photo of something beautiful. You get the most spectacular views from London Eye or up on Hampstead Heath. Not going to lie as a blogger and even though I don't post them it is the perfect place to take outfit shots and get photo inspiration. Places like Covent Garden, Oxford Street, Leicester Square are just the perfect backdrops for those candid shots. Amazing Transport Hub: Despite me and the vast majority of other Londoners having a bit of an on again off again relationship with London's transport it is the most amazing method of getting to other places within London as well as well as to the outskirts. However it's also the perfect place to get to other places such as Paris and other cities around Europe. With heathrow only a 20-30 minute train journey away from the center of London you're never far away from travelling the world. So there we have it. Just a few reasons as to why I love London. I mean, yes I live here and yes I might sort of be a little biased but it truly is one of the most amazing cities in the world and one I'll always call home however cringey and corny that might be. If you are from London like me or have once lived or studied here let me know what you favorite things are about the city below as I'd love to read your thoughts. Also my friend Beki who I mentioned at the beginning of this post also has a blog. If you would like to check her out then just click HERE to head on over. Have an amazing rest of the week and I'll speak to you all in my latest post.